Europe’s regions and cities are the gatekeepers of our shared cultural heritage. Locally and regionally elected representatives can draw on cultural heritage as a resource to build bridges across borders, to foster well-being and guarantee a good quality of life because cultural heritage is a key driver for a democratic and sustainable future. 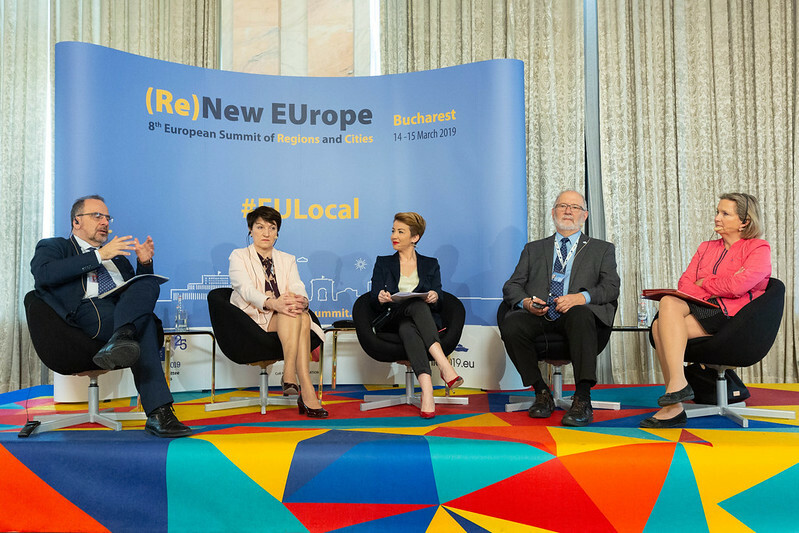 With these key messages, Europa Nostra’s Vice-President Piet Jaspaert intervened at the 8th European Summit of Regions and Cities “(Re)New EUrope” on 14-15 March held in Bucharest, Romania, and recalled to the participating locally and regionally elected representatives that cultural heritage is a strategic resource for the future of Europe. Calling on local & regional representatives at #EUlocal Summit to use Europe’s shared cultural heritage as strategic resource. Europa Nostra’s Vice-President Piet Jaspaert took the floor during a panel debate on citizens’ participation, stressing that “cultural heritage is about social cohesion, solidarity, shared responsibility for our natural and cultural environment” and that “cultural heritage counts for Europe and matters for citizens and communities” in Europe’s regions and cities. Above all, he added, “it tells a European story” that helps bridge the local and the European. In the presence of Luca Jahier, President of the European Economic and Social Committee, who was one of the panellists, Europa Nostra’s Vice-President expressed his gratitude that both President Jahier and the President of the European Committee of the Regions, Karl-Heinz Lambertz, were among the first signatories of the Berlin Call to Action “Cultural Heritage for the Future of Europe”, which had been presented by Europa Nostra last year. Piet Jaspaert called on all the elected representatives to give a bigger priority to cultural heritage as a positive and cohesive force for Europe. By doing so, regions and cities invest in a stronger sense of belonging to a larger European community while at the same time further strengthening the sense of belonging to a local or regional community: “The one does not exclude the other. But they enrich the other”. The Bucharest Summit was the largest political gathering of mayors, regional presidents and other elected local and regional representatives from across the European Union this year, aimed at agreeing on a common vision for the future of Europe. It was organised by the European Committee of the Regions, its Romanian delegation and the Romanian Presidency of the Council of the EU. The highlight of the Summit was the presentation of the Bucharest Declaration ‘Building the EU from the ground up with our regions and cities’. Its 10 key messages resume the view of Europe’s regions and cities on how to shape the future of Europe and their active and indispensable role therein. The Declaration was handed over to Romanian President Klaus Iohannis in his capacity as representative of the current EU presidency and host of the upcoming informal meeting of EU heads of state or government in the Romanian city Sibiu on 9 May 2019. The Declaration calls for an empowerment of Europe’s regions and cities so as to strengthen European democracy and allow the EU to reconnect to its citizens. With regard to strengthening the democratic foundations, the Declaration also recognises the need “to raise awareness amongst EU citizens, especially young people, about the European dimension of their identity and citizenship, in particular through education, culture and youth empowerment policies, in order to increase their feeling of belonging to the European project”.